We invite you to experience a magical Christmas and New Year during a 17-day expedition cruise. 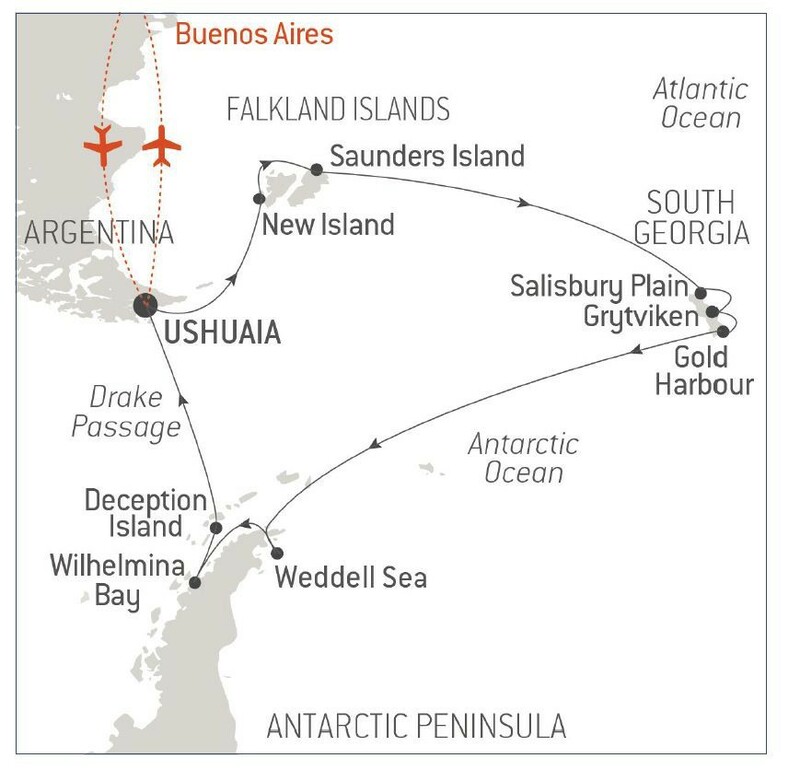 Capital of Argentina’s Tierra del Fuego province, Ushuaia lies in a bay opening into the Beagle Channel, at the country’s southernmost tip. Its colourful houses are framed against towering mountains, snow-capped in winter and summer alike. A ride on the heritage railway is an exciting excursion into the Tierra del Fuego National Park. A cruise in Ushuaia Bay is a perfect way to do some sea lion and Magellanic penguin spotting. This island with its distinctive jagged relief is located on the western edge of the Falkland Islands and is home to a tiny village of two families. Step onto the golden sand of its flower-lined beaches, beside which an old stone house still stands, and you'll feel like you've entered a natural paradise. A narrow pathway weaves around typical Falkland moorlands. Follow it and in under 20 minutes you'll find yourself at the heart of a colony of southern rockhopper penguins, black-browed albatross and imperial shags. It's the perfect opportunity to watch the albatross swoop down from the cliffs and skim the waves that crash against the rocks on the exposed side of the island. Make your way through the turbulent Woolly Gut strait and emerge in the stillness of Grave Cove. Located in the northern edge of the Falkland Islands, this bay owes its name to the vestiges of whalers’ graves that overlook the beach. As you step off the boat and onto the white-sand beach, you might find yourself escorted by a few hospitable Commerson's dolphins, elegantly adorned in black and white. A stroll along the grassy dunes will lead you to a vast plain of lush green grass, tended by a few sheep. On the other side of the island you'll find one of the largest gentoo penguin colonies in the area. With some luck, you'll also glimpse a sea lion scouring the waves for his next meal. Succumb to the magic of a place unlike any other. To this day, the mythical Antarctic Peninsula still holds real fascination and promises its visitors unforgettable moments. Throughout your adventure in this icy realm, you will find yourself in the heart of a spectacular decor in subtle shades of blue and white, surrounded by exceptional wildlife. Penguins, humpback whales, seals and giant petrels are at home here, as are elephant seals, fur seals, Antarctic minke whales, and orcas. Depending on which sites you will be lucky enough to visit, you may get the chance to observe them and share with them the beauty of these extreme parts. Each day, based on ice conditions, the Captain and the Expedition Leader will suggest Zodiac® outings or landings to discover the infinite riches of the Antarctic Peninsula. Glaciers, ice floe, tabletop icebergs, mountain peaks that plunge straight into the sea, volcanic beaches, research stations, enchanting bays, and vestiges of the whaling industry: these are the faces of the Antarctic that will likely reveal themselves to you, in a hushed and surreal atmosphere. You will sail in the wake of Jean-Baptiste Charcot, Adrien de Gerlache and Sir Ernest Shackleton, great Antarctic explorers who, from the 19th century, set out to conquer these remote and uninhabited lands. We are privileged guests in these extreme lands where we are at the mercy of weather and ice conditions. Landings on certain sites and the observation of certain wildlife cannot be guaranteed. They vary from day to day, making each cruise a unique experience. The Captain and the Expedition Leader will make every effort to ensure that your experience is as rich as possible, while complying with the safety rules and instructions imposed by the IAATO. A sleek silhouette, a welcoming intimate atmosphere, and the same philosophy that has made L'Austral and Le Boreal such a success. This magnificent yacht of only 132 staterooms and suites, all with balconies, has contemporary decor inspired by the luxury yachting world, with fluid lines and a modern colour scheme combining natural wood with shades of grey and white. White Corian counters in the lobby contrast with the warmth of leather to recall a boat's hull, while the central scuplture of enamelled pieces takes its inspiration from the sea. In the lounge bar, the carpet picks up a tennis stripe theme symbolising a certain idea of cruising, one synonomous with French elegance and a chic seaside spirit. 3 specially adapted wheelchair cabins (Deck 3 = Superior cabin no. 307, no balcony, Deck 4 = Prestige Cabin no. 407 - with balcony and Deck 5 = Prestige Cabin no 509, with balcony) and lifts to all decks/areas. Please click the following links to read more about Ponant and the other Ponant cruise ships. • Spend Christmas and New Year on the fringes of the ‘White Continent’. • Outings and shore visits in a Zodiac® with a team of experienced naturalist guides. • Wildlife: Magellanic penguins and Commerson’s dolphins in the Falkland Islands. King penguins, as well as numerous elephant seals and fur seals in South Georgia. Gentoo, Adélie and chinstrap penguins in the Peninsula. • Landscapes: vast moors dotted with moss and lichen in the Falkland Islands. Chains of snow-covered mountains, lush meadows and numerous glaciers in South Georgia. Drifting icebergs and ice floe in the Peninsula. Follow in the footsteps of the gold prospectors on this 8-day cruise brought to you by PONANT. This exceptional itinerary aboard Le Soléal will take you from Alaska to British ......click here to read more. PONANT invites you on a polar expedition cruise to the heart of the icy realm that is the Antarctic Peninsula. Embark on an unforgettable 11-day voyage and succumb to the ......click here to read more. Tabletop icebergs, growlers, drift or pack ice... the Antarctic has its own language, which you’ll soon speak fluently! We are offering you a chance to sail through the Heart of ......click here to read more.